FISCH is a language services provider based in Saint-Raphaël (France) with partners throughout the European Union, specializing in French, German, Italian and Spanish translations. FISCH was founded in 1989 specifically to fulfill the music industry’s demand for high quality translation solutions. 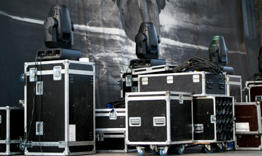 Unlike other multi-language translation providers, we are solely focused on music, audio, video and lighting equipment. And in addition to the technical aspect of our work, you can count on the best and most appropriate style. We strive to become a preferred or strategic partner to our clients. In turn, clients should expect the unusual from FISCH and challenge us with their most demanding projects. We provide end-to-end software localization solutions that can help prepare your applications for a global launch. If foreign buyers can’t read your website, they likely won’t buy from it. FISCH has the ability to fully localize your corporate web pages, so billions of internet users can gain access to your company information in just one click. Straight translation is not enough. The language needs to be accurate and to flow naturally. Our goal is to make the reader at home with a text that was thought and written in a different language while ensuring that your contents are clearly understood. Script translation is one of the greatest challenges amongst the localization services because other language lengths are often much different than that of the English source content. Most translators are only used to translating for the written word - and when spoken, their language can sound awkward. We are aware of this and we always aim, in respect of the timecode restraints, to create a great natural-sounding voice-over translation. Video tutorials? Product videos? Your own YouTube channel? The cheapest and fastest way to be understood by all customers and prospects is subtitling. Chosen terms should be those used by actual customers. Only a dedicated specialist knows the contemporary terminology used by a particular industry. Translations are accurately fitted to existing layouts while retaining the integrity of the artwork. Being a specialist requires knowing not only products but also their market. This is why our rates are tailored for it. On time, within budget, your printer, web master, developer can process this translation as easily as the English original. Our methodology is the direct result of nearly 25 years of combined translation, localization and project management experience working for clients in our industry. From job submission to final translation archiving, we take responsibility for the life cycle of your translated documents. We combine IT knowledge, technology, and language expertise to provide smart solutions that are tailored to your company, your products, and your clients. We think that the only way to ensure the quality of the final product is to do the work in-house. Our innovative translation management system can help you streamline the process of managing translations, ensure better quality upfront and improve content reuse – resulting in reduced translation costs over the long haul. This sophisticated translation management system holds a translation memory database of your previously approved translation content. This is important because it allows to reuse previously translated segments rather than translating future documents completely from scratch – which can save you a substantial amount of money. No matter how good the quality of the translation, a layout or typographical imprecision dramatically impacts how consumers perceive the product or the brand. As well as offering translation and interpreting services, FISCH has an experienced team of in-house designers to assist you in your desktop publishing requirements. We can adapt existing documents to be used in different languages. Our multilingual desktop publishing capabilities surpass those of our industry competitors. With expertise in virtually all applications, our skilled layout specialists provide graphics and layout services in all our languages. A review by the original translation team ensures precision and accuracy. For expert work you will need professionals who work with other writing systems and conventions and know how to fit more text into a layout designed for an English version. This process provides our clients with additional assurance that no line or word breaks have been inappropriately altered during the course of formatting. The need for “localization” beyond translation arose due to the shift to an electronic medium in which the text subject to translation is couched. To turn software from one language version to another calls for extra technical processes such as extraction and reintegration of text fragments (known as “strings”) and testing to ensure that the localized software functions properly and all linguistic conversions fit both semantically and in the space allocated. Localization entails adapting products in electronic form to make them “linguistically and culturally appropriate for a particular local market”. The sim-ship (simultaneous shipment) model, where the original product, normally in English language, is released together with the localized versions, is an accepted model in the localization industry today, but has a significant implication for translation, where the translator has to work with unstable source content which could keep changing throughout the duration of the project. A commonly accepted principle in the industry is that localized products should retain “the look and feel of the locally-made products”. For this reason, our work for Ableton, Celemony, PreSonus (amongst others) earned us a solid reputation in this industry. You think a specialist translator is more expensive than a non specialized translation agency? In our case you're wrong... Our basic average rate is 30 to 40% lower!!! Remember that agencies are middle-men without any in-house skilled specialized translator. We are unique in the localization industry because of our in-house, all-in-one philosophy. During 2012 Fiscal Year, one of our Japanese clients saved 42% on manuals translation costs (calculated from our regular prices). We are experienced users of Computer Aided Translation (CAT) tools for project management. This gives us the possibility to translate content in the fastest and most efficient way, quickly respond to any quotation request from our clients, create and build translation memories for consistency and cost saving and build terminology database. You can experience more cost savings with a better translation memory improving content reuse. Ours is huge and fully dedicated to your industry (can you imagine how many times we translated safety instructions, EU directives or specifications during the past 24 years...). We store all translations in our Translation Memory System. This creates our translation memory database, which is a store of all your translations so you can reuse phrases and paragraphs again. This means that you never have to pay full price to translate the same text again. When you consider the potential economies from re-using text across documents, updates and file formats, the savings in terms of overall cost of translation per word are clear. - If you supply us your native DTP file (InDesign, Word, FrameMaker etc.) we directly place the translated text in it for no extra charge. Please note these are guidelines. For an accurate quote benefiting from our translation memory, please contact us. when the French distributor of Roland products heavily requested translated owner's manuals for their products. non enim aliquet condimentum. Nam aliquam pretium feugiat. Duis sem est, viverra eu interdum ac, suscipit nec mauris. Suspendisse tempor sagittis! In justo est, sollicitudin eu scelerisque aliquam pretium pretium, placerat eget elit. Praesent faucibus odio at rhoncus. Pellentesque vitae tortor id neque fermentum pretium. Maecenas ac lacus ut neque rhoncus laoreet sed id tellus. Donec justo tellus, tincidunt vitae pellentesque nec, pharetra a orci. Praesent nunc nunc, egestas eget elementum sed; rutrum eget metus! Vestibulum congue congue dui ut porta. Aenean laoreet viverra turpis. sagittis non tortor. Vivamus eu enim a orci accumsan tincidunt ut ut elit. Vestibulum nisi orci, rutrum ac auctor non, viverra et magna? Sed vehicula sem et arcu accumsan. In non pellentesque ipsum. Curabitur facilisis pharetra. Donec justo urna, malesuada a viverra ac, pellentesque vitae nunc. Aenean ac leo eget nunc fringilla fringilla a non nulla! Nunc orci mi, venenatis quis ultrices vauctor ipsum. Duis non tellus non risus placerat adipiscing. Mauris volutpat, nunc quis tempus pulvinar, urna ipsum ultricies dolor, nec scelerisque nunc diam quis lectusitae, congue non nibh. Nulla bibendum. id pretium turpis bibendum vel. Aliquam a odio arcu. Morbi a dignissim nisl? Aenean aliquet magna in nulla congue vehicula. Morbi dignissim turpis sed sodales. In tincidunt dapibus semper. Nullam non orci eu massa tempus aliquam! Quisque metus at neque aliquam sit amet iaculis lacus iaculis. Etiam ultrices condimentum justo eu viverra. Curabitur lacinia tristique imperdiet. Aenean bibendum vehicula diaAliquam urna eu dolor volutpat lobortis! Curabitur pellentesque, turpis sit amet iaculis condimentum, urna mi aliquet turpis, itae pharetra mauris eros non arcu. Aenean felis augue, dignissim. Mauris fermentum tortor non enim aliquet condimentum. Nam aliquam pretium feugiat. Duis sem est, viverra eu interdum ac, suscipit nec mauris. Suspendisse tempor sagittis! In justo est, sollicitudin eu scelerisque aliquam pretium pretium, placerat eget elit. Praesent faucibus odio at rhoncus. Pellentesque vitae tortor id neque fermentum pretium. Maecenas ac lacus ut neque rhoncus laoreet sed id tellus. Donec justo tellus, tincidunt vitae pellentesque nec, pharetra a orci. Praesent nunc nunc, egestas eget elementum sed; rutrum eget metus! Vestibulum congue congue dui ut porta. Aenean laoreet viverra turpis.